Margaret Sedlar, with a first place ribbon from the Clallam County Fair. These five bulbs of 'Star Fighter' were planted just after the Northwest Flower and Garden Show in a twelve-inch wide, deep plastic pot and grown on the balcony of her second floor apartment. 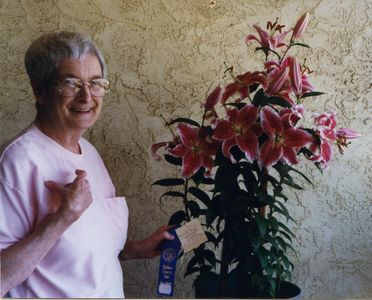 Her lilies enjoyed bright indirect light from the Northern exposure and were fed diluted liquid fertilizer every two weeks.